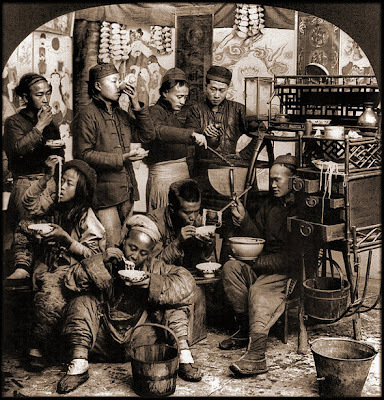 Travelling around the web for something else, as you do, I came across this first image of a Shanghai wonton vendor by the noted German sinologist Ernst Boerschmann. He worked for fifty years documenting China from 1907 onwards. Then by chance a few days later I found the second image by another photographer and I was struck by the similarity of these street vendors' carts. These look like wonderful examples of peasant craftsmanship and very practical solutions to a whole host of design challenges. The weight of the lighter ingredients and utensils is shifted further back to counterbalance the heavier water and stove on the front. They have to be light but very strong obviously but they also have to be compact, as the pedlar did not ply on the main thoroughfares but in the back alleys in the crowded residential districts where most of the people live. They remind me too of the backstage prop carts and road boxes I used to make (and obsessed about finding the perfect design for). 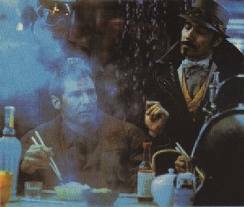 With 'street food' becoming its own cuisine hipster scene, I wouldn't doubt something like this might be revived, unless it never went away. Do any of these carts still exist? Was there a workshop in Shanghai making them and a Mister Big who controlled them like the New York hot dog vendors? In the front, like a camel's head, is a wooden cover for a wok over a wood-burning stove. The camel had a bamboo clapper or gong on one leg that the pedlar would beat to get attention. On the 'bridge' was a shelf for bottles and jars of soy sauce, lard, chili oil, spicy paste, fine salt, green onion, garlic leaves, ginger, tofu, pepper, MSG and other ingredients. The shelves would be stacked with blue china bowls and spoons, covered with a gauze to stop the dust. The 'camel' rested on its owner's right shoulder. The back of the camel had small drawers and on the top was cutting board. In the drawers were minced meats, wonton skins and wrapped wontons. Below this was the fuel for the stove. When the camel was put down on the pitch, the peddler would fill the pan full of water and light the fire. While waiting for the water to boil, they would pack small wontons on the chopping block, according to customer's taste. Camels were made with more than 200 pieces of mahogany and each component was put together with traditional mortise and tenon joints. The cultural influence of the humble noodle is enormous, they are one of the world's universal foods. Funnily enough, the noodle seller also shows up in texts on business management as case studies of the constraints on the solo entrepreneur. Did one of these here though found a billion-dollar ramen empire? UK noodle bar Wagamama was sold off by its founders in 2011 for £250M, not a bad result from starting with one location in 1992. A little further digging uncovered a history of the Shanghai street pedlar (including the third image) and their many dishes. I am hungry for some Dan Dan Mein right now.